Crock Pot Italian Sloppy Joes combine Turkey Italian Sausage, peppers, and onions, and I bet the family will love this interesting variation for slow cooker Sloppy Joes! Click here to see The BEST Slow Cooker Sloppy Joes from Food Bloggers! Click here to see The BEST Instant Pot or Pressure Cooker Sloppy Joes! For Friday Favorites we spotlight past recipes that you may have missed, and this recipe for Crock Pot Italian Sloppy Joes from Skinnytaste looks like perfect eat-outside food for Fourth of July weekend. I love turkey Italian sausage like Gina uses in this recipe, yum! Sometimes even a classic like Slow Cooker Sloppy Joes needs a new twist, and this I think Crock Pot Italian Sloppy Joes sound like a delicious variation. Gina uses turkey Italian sausage, which is browned and then added to the slow cooker with peppers, onions, tomatoes and seasonings. She serves the Italian Sloppy Joe mixture on rolls with spinach and Provolone; this sounds like a perfect Summer Dinner. 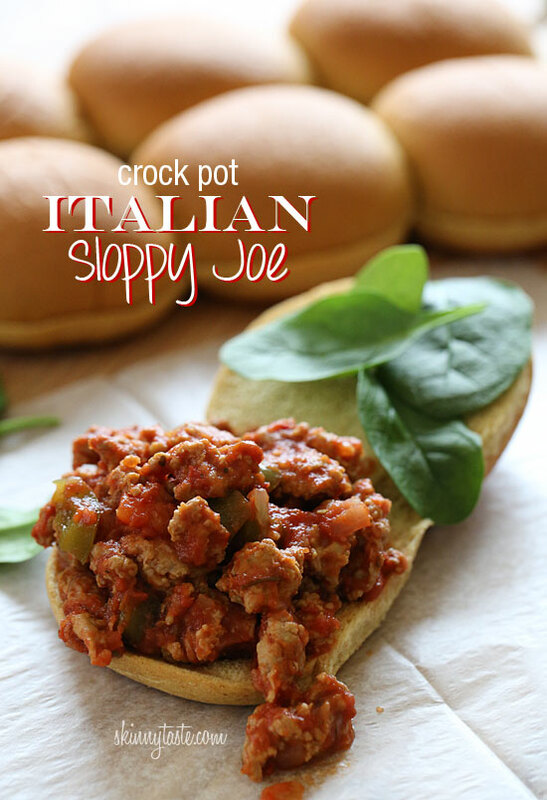 Get the complete recipe for Crock Pot Italian Sloppy Joes from Skinnytaste. Click here to see all the Sausage and Meatball Recipes. We're on the same wave length! I've just made a beef Sloppy Joe in the slow cooker, with a more Mexican twist. Love this version. Lydia, can't wait to see your new one. I love turkey Italian sausage, so this sounds great to me. I tried this last week and loved it. I got it into the crockpot in about 10 minutes on a busy day and was so grateful to have a yummy dinner at the end of the day. Would also be great on spaghetti squash or pasta. Amy, thanks for sharing you feedback; so glad you enjoyed it!